There are certain points in the year, when you have to buy a present for a man. Aside from one’s birthday, there is Valentines Day, Fathers’ Day and Christmas where gifting is a big part of family and friendship. In recent years, gifting experiences has become more popular than ever as people want to give presents that are remembered. From Gin Tasting to Beekeeping, there is a wide range of workshops and activities that are on offer. Taking guys out of their comfort zone, or testing them to learn a new skill in a day, most people come away from experiences feeling like they are richer for the experience. The other reason to buy a gift, is to get your way in the kindest manner. Traditionally, many people get given socks at Christmas, and that really links back to hinting that the recipient needs new ones. How do you make someone do something? you pay for it in advance, and give it as a present. It would be rude not to? Aldwyn & Sons was created by men for men. We want to give men the environment to relax and enjoy a pedicure. Pedicures have health and wellness benefits including the detection of any existing problems and aids the prevention of future problems. Treatments are designed to make men walk out with a spring in their step, both physically and mentally. Scientific research suggests people prefer experiences to gifts, and a pedicure is one of the best experiences you can have. 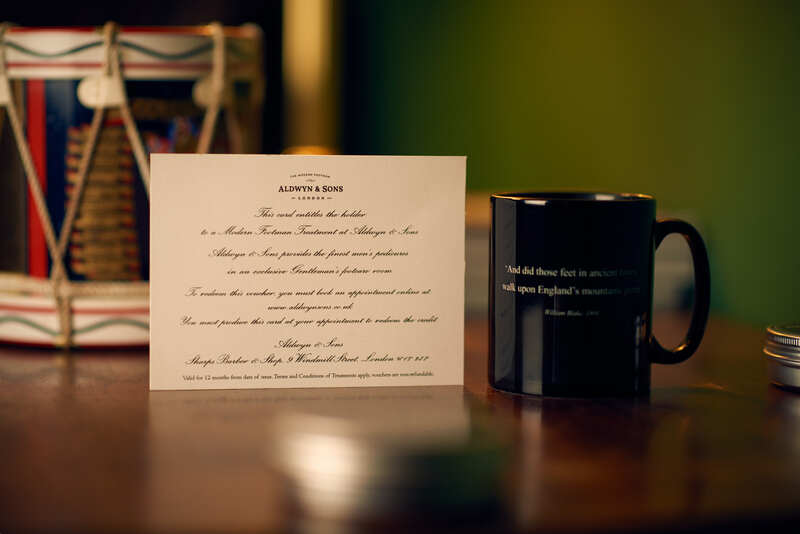 Aldwyn & Sons offers gift cards for its signature ‘Modern Footman’ treatment. The Modern Footman is a luxury pedicure for men that includes clipping and filing of the nails, cuticle treatment, removal of dead skin and exfoliation followed by a moisturising foot massage. Our gift cards are easy to redeem with the recipient able to book an appointment and bring the card to their appointment.